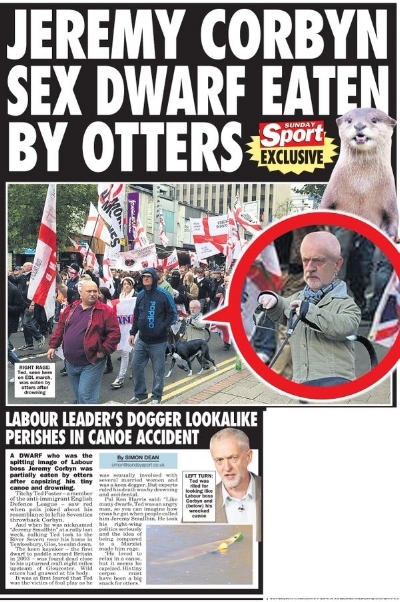 News in the United Kingdom. The tripartite author team of Andy Chadwick, Ben O'Loughlin and Christian Vaccari have published their third recent study examining social media and political behaviour. The article, Do Tabloids Poison the Well of Social Media: Explaining Democratically Dysfunctional News Sharing, is published in New Media & Society. In it, they find that tabloid news is more strongly connected with democratically dysfunctional behaviours, and that many people freely admit to sharing news they know is inaccurate or false. The paper offers unique insights into the reactions of social media users when called out on sharing misinformation - some appear ashamed, others are amused. Does this mean there are more long-term maladies in British democracy that go beyond Cambridge Analytica and Russian trolling? Read here. The use of social media for sharing political information and the status of news as an essential raw material for good citizenship are both generating increasing public concern. We add to the debates about misinformation, disinformation, and “fake news” using a new theoretical framework and a unique research design integrating survey data and analysis of observed news sharing behaviors on social media. Using a media-as-resources perspective, we theorize that there are elective affinities between tabloid news and misinformation and disinformation behaviors on social media. Integrating four data sets we constructed during the 2017 UK election campaign—individual-level data on news sharing (N = 1,525,748 tweets), website data (N = 17,989 web domains), news article data (N = 641 articles), and data from a custom survey of Twitter users (N= 1313 respondents)—we find that sharing tabloid news on social media is a significant predictor of democratically dysfunctional misinformation and disinformation behaviors. We explain the consequences of this finding for the civic culture of social media and the direction of future scholarship on fake news.